W 40 X 30 ~ ACTUAL SIZE IS 38 X 29 ~ LEG OPENING IS 9 1/2. No Two-Horse Patch on this model jeans ~ RARE! NORMAL SIGNS OF WEAR FOR AN OLDER PAIR OF JEANS ~. ONLY FLAW I CAN SEE IS SLIGHT WEAR IN FABRIC ON LOWER LEFT LEG ~ SEE PICTURES ~ NOTHING MAJOR! Awesome vintage Levi’s 550’s! Black wash and 100% cotton. These jeans have been cut off at the ankles and now have a 29” inseam. Great look and super stylish! 30” waist. These have plenty of wear typical of a well worn pair of blue jeans, but still have lots of life in them. W36 - L30 - actual W33 L29. Our goal is to send zero waste to landfills, of the thousands of textiles & goods that people throw away every year, as much. as 95% could be re-worn or recycled or re-used. Brittania Acid Wash Denim Jeans. 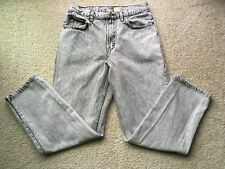 This is a very rare 1980s acid wash jeans. Inseam: ~29. Leg opening: ~15”. The size is listed above for your convenience. They are stiff, raw, unwashed, roughly 10 oz denim. They feature silver buttons. They are all heavily creased from being folded for 25 years. The Overalls are Sanforized, and will be expected to shrink up to 1" when washed. These jeans are very rare and in amazing condition. Rise: 11in. Waist: 30in. All clothing is Professionally cleaned and laundered! Excellent condition vintage 1980s stone washed Gitano jeans. Men's. Waist is 36". Inseam is 29". Crotch rise is 14". Waist to hem is 41.5". No wear to pant leg hem. Back waist tag labels these as overdyed Arcticwashed jeans. Wide front pockets. One side leg pocket for pen/pencil. WAIST SIDE TO SIDE DOUBLED: 34. INSEAM: 29. MATERIALS: 100% COTTON. DRY CLEAN ONLY. THIGH STRAIGHT ACROSS: 13. MADE IN: USA. Rise: 12.5". Waist to Hem: 39". Inseam: 29". MADE IN USA ! 100% COTTON RAW DENIM! Legs were taken in see pic, color is better than photos, no thinning - retains 95% original blue color! 100% Cotton. Made in USA. It may show signs of very minor wear and use that does not affect presentation or function. They feature a high waist, button fly, classic 5 pockets design, red tab, and a straight leg. Length-39". Inseam-29 1/2". All of the original brass hardware is intact and the denim is still a very dark indigo Blue color as seen in our pics. They have been personalized on the inside and say " Grassman". Have shrunk down a size. Material: 100% cotton. Total Length: 40 1/2". Waist: 15". Men’s Vintage Levi’s 40547-2317 Action Jeans, Size 36x30. The Action series was made with a Polyester/Cotton Blend rather than just Cotton. Judging from the rivets, patch, and brown tab, these jeans were made in the 1980’s. Very Good cosmetic condition. Very slight fading, a couple small spots. These jeans have a heavy, worn-in crease from the last few decades of storage. Please reference photos for accurate condition. MEASUREMENTS Tag: 36x30 Waist: 36” Rise: 12” Inseam: 29” Waist to Hem: 40” Item will ship next day, Priority Mail, tracked and insured. Things go better in broken in jeans! Red tab is clipped off. 501-0000, This jean is broken in & shrink. -This jean Closes with a Classic button fly. button holes are intact. - The jeans have classic 5 pockets. They feature a high waist, YKK zipper and button fly, classic 5 pocket design, gold top stitching, and a straight leg. Front Rise-11". Inseam-29". 1980s denim! MADE IN USA! stone wash - GREAT COLOR! Condition: Pre-owned. Material: 100% Cotton. Front Rise: 11.5". Outseam: 39". This is a pair of Men’s Vintage Rustler Jeans, Size 40x30. Excellent cosmetic condition, no holes, stains, or frays. Some slight fading/creasing due to age, but look good for their age. Please reference photos for accurate condition. MEASUREMENTS Tag: 40x30 Waist: 40” Inseam: 29” Rise: 13” Waist to Hem: 41” Leg at Hem: 20” Item will ship next day, Priority Mail, tracked and insured. W32 L29 1/2. Our goal is to send zero waste to landfills, of the thousands of textiles & goods that people throw away every year, as much. as 95% could be re-worn or recycled or re-used. Total length: 39 1/2". Made in usa, repaired belt loop on the waist on left hip see pic, no other holes or fraying- legs were re cuffed. The jeans' hem was taken out showing the hem line. The star patches were added, ironed on, easily removed. One of the patches covers one small tear. Leg Opening Circumference 20". Inseam 29". Rise--Front 12" Back 15". 1980s era, perfect fade, made in usa, Missing the rear right belt loop, has a few tiny fray holes only. Blue Jeans. SIZE→ 36 x 29. Waist → 36 ". Inseam → 29 ". Length→ 39.5". Vintage Late 1980’s Lee Denim Jeans Size 32 X 29. Nice fading. Beautiful bright blue color. Some loose threading at the hems. Rivet on coin pocket is detached. Original tag reads size 34x30. Shipped with USPS Priority Mail. Things go better in broken in jeans! 501, This jean is broken in & shrink. -This jean Closes with a Classic button fly that has all its buttons present and the button holes are intact. - The jeans have classic 5 pockets. Men’s Vintage Levi’s 505 Blue Jeans, Size 36x29. Judging from the rivets, patch, and orange tab, these jeans were made between 1988-1992. Very Good cosmetic condition. Very slight fading/fraying, no holes or stains. Please reference photos for accurate condition. MEASUREMENTS Tag: 36x29 Waist: 35” Rise: 12” Inseam: 29” Waist to Hem: 40” Item will ship next day, Priority Mail, tracked and insured. Men’s Vintage Levi’s 40547-2317 Action Jeans, Size 36x31. The Action series was made with a Polyester/Cotton Blend rather than just Cotton. Judging from the rivets, patch, and brown tab, these jeans were made in the 1980’s. Good cosmetic condition. Very slight fading, a couple small spots. These jeans have a heavy, worn-in crease from the last few decades of storage. Please reference photos for accurate condition. MEASUREMENTS Tag: 36x31 Waist: 36” Rise: 12” Inseam: 29.5” Waist to Hem: 39” Item will ship next day, Priority Mail, tracked and insured. Light fade - no thinning - made in usa - cuffs have edge fraying. Color & Content: blue 100% cotton denim. Inseam 29". Length from top of waist 40 1/2".